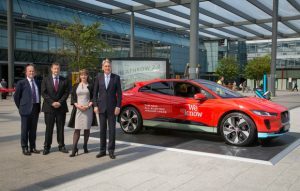 Heathrow, Jaguar and travel services company WeKnowGroup have signed a landmark deal that will see a fleet of up to 200 fully-electric Jaguar I-PACE vehicles available to passengers for travel to and from Heathrow. Initially the fleet will be made up of 50 I-PACEs available from summer 2018 with the option to add a further 150 cars in the next 12 months. This fleet will support up to 1,000 electric vehicle journeys to and from Heathrow each day – saving over eight tonnes of oxides of nitrogen (NOx) emissions each year, says the Airport. To support the service, WeKnowGroup will be installing a dedicated charging hub at Heathrow, which will be the largest in the UK. Designed and engineered by Jaguar Land Rover in the UK, the all-electric I-PACE is at the forefront of the zero emissions revolution. Following a number of announcements by car manufacturers, Government and the Mayor of London, the CEBR analysis shows that by 2030 up to 58% of vehicles on London’s roads will be electric. The introduction of the T-Charge for more polluting vehicles in October 2017, the Ultra-Low Emission Zone and falling purchasing costs for an electric vehicle are some of the main causes driving forward this forecasted shift, which will could result in the average concentration of nitrogen dioxide (NO2) across the city reducing by as much as 8%. Londoner-based travellers to Heathrow 32% said they would be fairly likely (22%) or very likely (9%) to use electric taxis to access the airport if these were made more available. Heathrow already has one of the largest corporate electric vehicle fleets in the UK, and the highest density of charging infrastructure in Europe, and it says it is taking further action to promote the take-up of EVs in and around the airport. This includes a year-on-year increase in more electric vehicle charging points through a £5m investment, the trial of electric buses for airside passengers and plans for an ultra-low emission zone airside. Heathrow has also signed up to EV100, a global initiative bringing together companies committed to accelerating the transition to electric vehicles.